This week Cara and I went with the group and did selective focus. I love the softness of Cara's shot. I am so drawn to the rippling edge of the leaf. I cheated a little bit and used a shot I took last week. These are some brussel sprouts from our garden. For more great photos head on over to Mental Inventory. Ohhhh, these are really beautiful - love the muted colors. Wow, brussel sprouts from your garden?!? You must have nice warm weather! I love the theme, selective focus - sure some nice shots ladies! 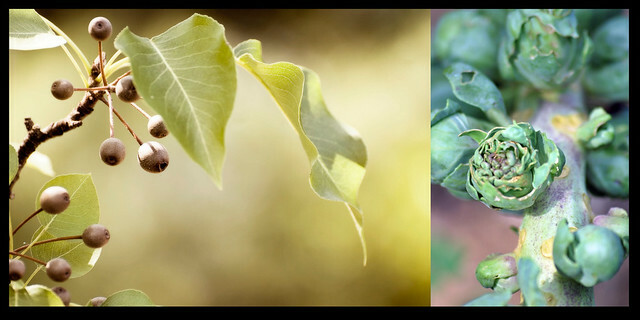 I love these for so many reasons......I am a huge fan of nature shots....I love all the green in this diptych. I really like the perspective for your shot. Haley-there was no e-mail address connected to your account so I was not able to respond directly to you. If you check, I have a Nikon D60. I use the kit lens most of the time. This shot was taken with a 35mm 1.8 Nikon Lens. I hope that helps. Great shots of selective focus. Beautiful shades of green. Both shots are beautiful. You know I have never tried brussel srouts? so rich and green, both of them! love the nature vibe of the pair together. I had fun with this theme. I love that yours was in your garden. I love brussel sprout, especially roasted! Mmmmmm!